AmeriCommerce online stores feature a robust pricing system that allows you to set many different levels of pricing for each item. Prices are modified from your base price that you set in the Product Editor under the General tab. You can enter the Product Editor by finding an existing product in your catalog or by choosing "Save & Edit" when you create a new item. Note: Americommerce has a fairly unique ability to allow up to 4 Currency Decimal Places. The setting can be found in settings > catalog controls the amount of decimal places to show for currency values on the product details page. This gives greater control over pricing by allowing you to extend prices up to 4 decimal places. Extra decimal places will be displayed ONLY on the product details page and will be rounded to 2 decimal places elsewhere on the front end of the site. All price calculations will still take the extra precision into account. The final total pricing is always rounded though as we can't send fractional cents to gateways, but it will at least calculate price * quantity accurately and then round. From here the General tab will open in the editor and you can change many basic criteria for the item. Basic pricing options found here include inputting your cost and setting the retail price along with the consumer's base price. 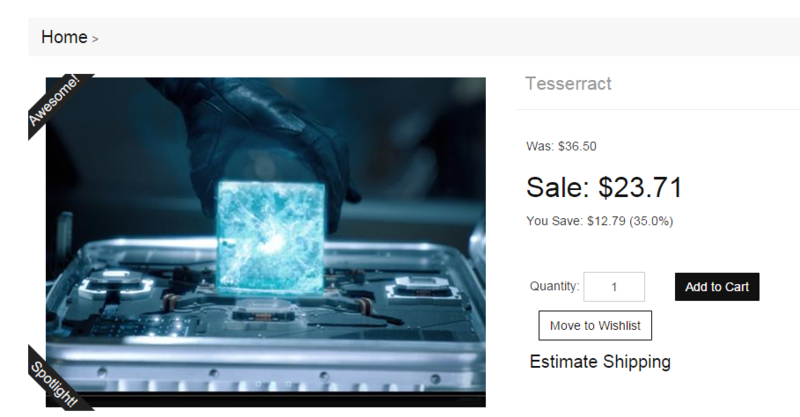 Retail: This price is displayed on your site with a strikethrough and shows your base price beneath that amount. Your Cost: The amount you pay for an item. This is optional, but giving your cost allows you to track profit. Base Price: This is the item's selling price. All modification for discounts or special pricing are calculated using this price. Call for Price: Some manufacturers will not allow the price to be displayed when it drops under a specified amount. Checking this box allows you to follow those guidelines while still having the retail and base price information available to you. Min and Max Quantity: This sets the minimum or maximum amount of an items that a customer can order. Other options include spotlighting the item on your homepage, adding custom flags to the item such as New or Reduced, and setting the item as tax-free. 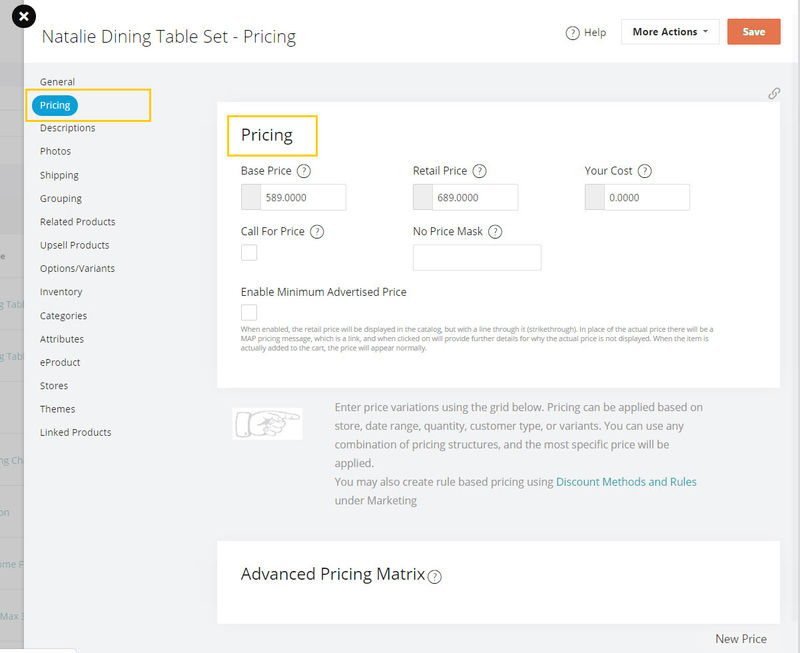 For advanced pricing options, you must select the Pricing tab and enter the Advanced Pricing Matrix. 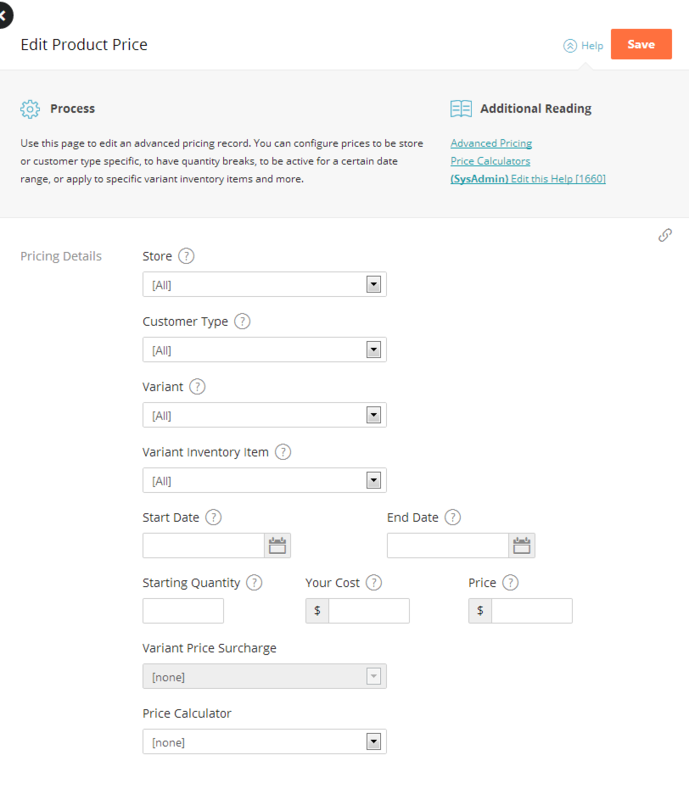 This allows you pricing flexibility based on which store you are selling from (if you are running multiple storefronts) and who you are selling to (retail or wholesale customers), as well as pricing based on date ranges. To add a new price, first click the New Price button. Then input the information for your products advanced pricing. To add store level pricing you will need to add a new row for each store and put the corresponding price in each. Each price needs its own row and needs to contain all of the criteria that is necessary for that price. 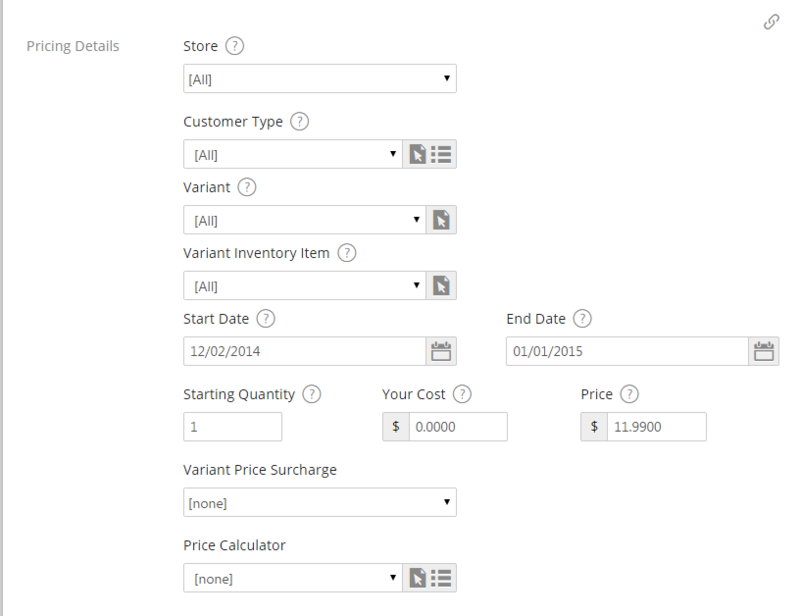 As seen in the example, you can combine criteria to make different quantity prices for each store. Setting the start and end date will determine how long your sale price will show on the product. If you have multiple products you'd like to use the Advanced Pricing with, you can also change them in bulk with an import. Check out our article here on importing items with advanced pricing.